WHY IS THE CLIMATE CHANGING NOW? WHAT DOES CLIMATE CHANGE MEAN FOR HUMAN SOCIETY? The climate is the prevailing conditions of temperature, rainfall, wind and other aspects of the weather in a particular location. While the weather is always changing, it averages out into a type of climate over time. Both nature and human societies adapt to their local climate. Climates have also changed naturally over long periods of time (many centuries), such as when the planet went into and out of ice ages. Even small natural fluctuations in climate can have severe impacts on human societies. Today, when we speak of climate change, we generally refer to a rapid change in climates around the planet due to human activities which are causing global warming. The carbon dioxide level in the atmosphere is rising rapidly as we burn fossil fuels and change land use. Carbon dioxide is a greenhouse gas that traps heat. More heat in the atmosphere and oceans changes air circulation and climate. Local effects will be highly variable around the world, and are not easily predicted. Various computer models of the global climate are used to predict the effect of rising greenhouse gas levels on the climate. The Intergovernmental Panel on Climate Change confirms a significant human climate impact. When life began on Earth, there was no oxygen in the atmosphere, which was mostly nitrogen and carbon dioxide. 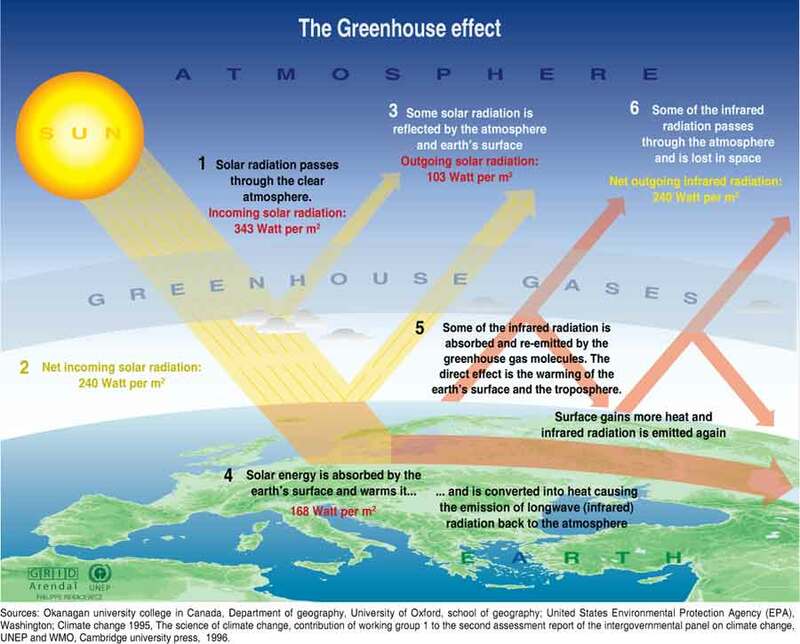 Carbon dioxide (CO2) is a greenhouse gas, that is it traps heat in the atmosphere just like the glass in a greenhouse or window, letting the light through but preventing heat (infrared radiation) from going back out. The Earth would have been very warm at that time. The first simple plant life (bluegreen algae or cyanobacteria) was able to capture the energy in sunlight and use it to make sugars (carbohydrates) to grow with, taking carbon from the carbon dioxide and releasing oxygen. This lowered the concentration of carbon dioxide in the air over hundreds of millions of years and cooled the planet to a temperature more suitable for life. The availability of oxygen made animal life possible. As the early life died and was buried, it was fossilized over time. With the pressure of layers above, the carbon in these fossil deposits became oil, coal and natural gas. Carbon from plant and animal shells also was stored as limestone. Early life therefore made the planet more habitable by removing and storing away carbon. 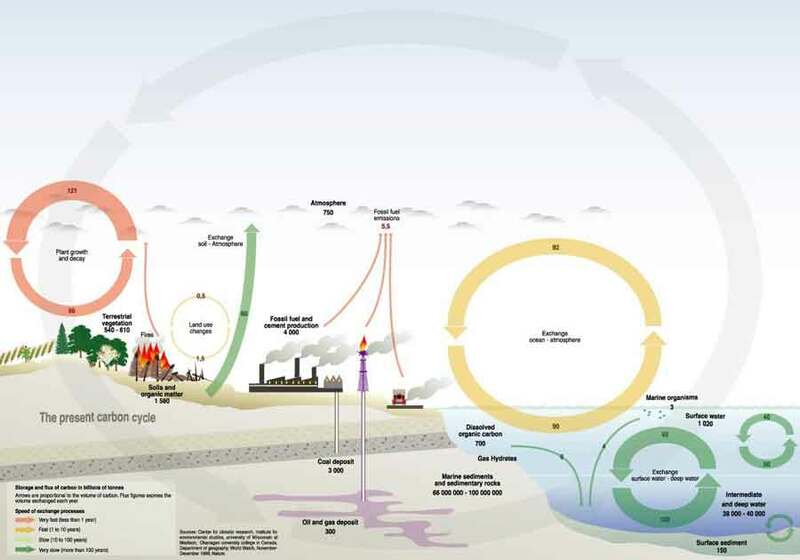 Today some carbon moves between land, sea and air in a carbon cycle driven by biological, chemical and human activities, as illustrated below. 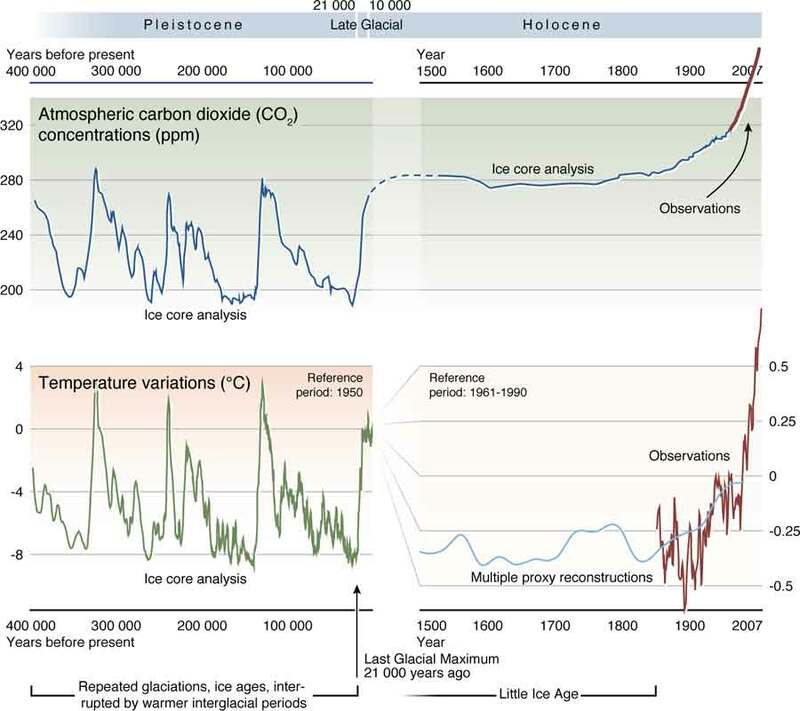 Until recently, the level of carbon dioxide in the air stayed within a relatively narrow range, going up and down a little with the climate cycles. We discovered the usefulness of the ancient solar energy stored in fossil fuel deposits two hundred years ago, and began removing the coal, oil and gas to power our industrial civilization. Burning fossil fuels for energy produces carbon dioxide. While this energy subsidy does so much work for us, it unfortunately is rapidly returning to the atmosphere carbon that was stored away over hundreds of millions of years. The rising level of carbon dioxide in the air is a major cause of global warming. More than half of greenhouse gases come from the industrialized countries burning fossil fuels. Carbon is also stored in trees and other vegetation, and in roots, humus and other organic matter in the soil. Deforestation, changing land use and overuse of soil in agriculture also release carbon dioxide back into the atmosphere. This is mostly happening today in developing countries of Asia, Africa and Latin America. There are other greenhouse gases that also contribute to global warming, including methane from natural gas, livestock, rice farming, and melting permafrost, and nitrous oxide from fertilizers and burning fossil fuels. Water vapour and some man-made chemicals are also important. Not all carbon dioxide stays in the atmosphere. Some is taken up by growing plants. A lot dissolves in the oceans. While this removes it as a source of global warming, it turns into carbonic acid in seawater and makes the oceans more acid, reducing the ability of plankton, shellfish and corals to make their skeletons. Global carbon dioxide emissions from fossil fuel use have accelerated since 2000. The rise in the 1990s was 0.7% per year, but it has increased to 2.9% per year since 2000, which will mean a 39% increase by 2030. There are three causes: the growth in the world economy (although the recession produced a temporary decrease in 2008), the rise of coal use in China and India, and a weakening of natural carbon sinks (forests, seas, soils) as they reach saturation. The growth in atmospheric CO2 is thus about 35% higher than was expected a few years ago. As a result of all these activities, carbon dioxide has risen in the atmosphere from a concentration of 270 ppm to 386 ppm, and at the present rate of increase could easily reach 450 ppm by mid-century and 700 ppm or more by 2100. Rising CO2 levels and rising temperatures are very closely linked. Many scientists say anything over 350 ppm will produce dangerous levels of global warming. 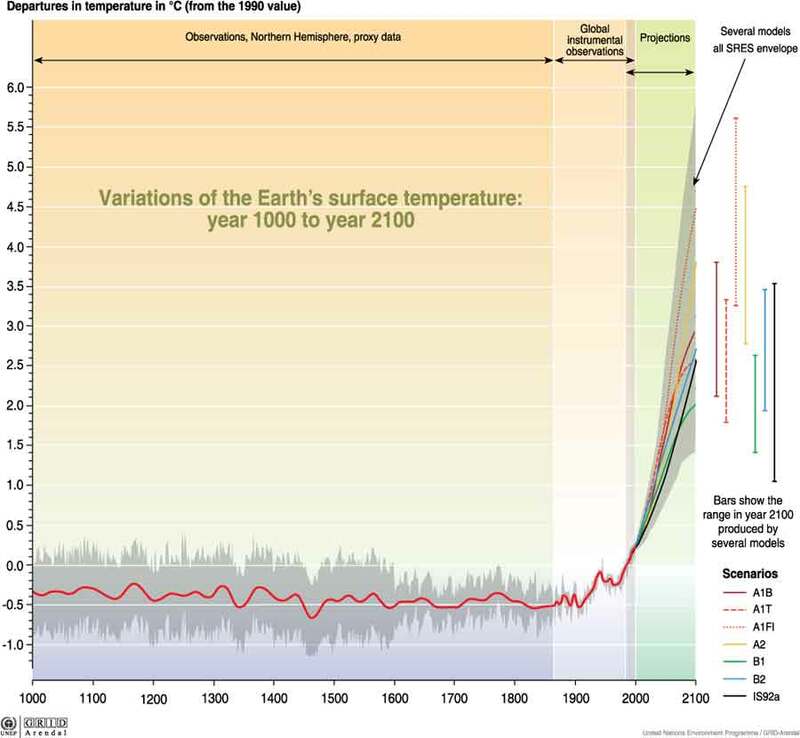 As you can see from these charts, the rise in temperature is accelerating. Such a rapid rise in global temperature has never happened before, so it is hard to predict its consequences. It is causing climate change at a rate faster than anyone expected even a few years ago. The planet does not warm equally everywhere. The temperature change is highest at the poles. 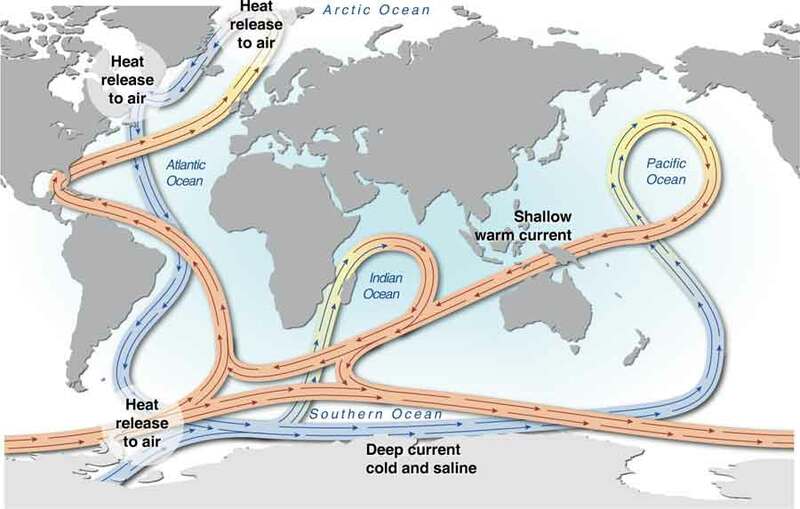 Some places may even cool down as ocean currents change heat distribution around the planet. The temperature has already risen considerably in many regions, as shown in the diagramme below. 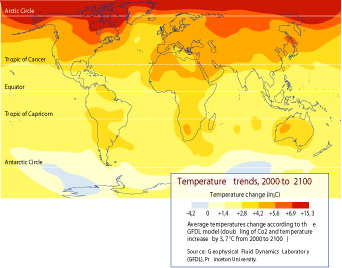 By 2100, the temperatures are expected to be much higher, as shown in the projection below. Some of the strongest signs of climate change are biological, since animals and plants also feel and respond to the climate. Many species are changing their latitudinal and altitudinal distributions in response to rising temperatures, with warm species moving towards the poles and others going higher in mountain areas. Coral reefs have suffered bleaching and died from unusually high ocean temperatures in all oceans. There are also signals in weather patterns. The number of the strongest (category 5) cyclones (hurricanes) has increased in all oceans over the last 30 years. The last 12 years have seen 11 of the warmest years ever recorded. The polar areas are changing fastest. Half of the permafrost in the Arctic is expected to melt by 2050 and 90% before 2100, releasing methane, a powerful greenhouse gas. 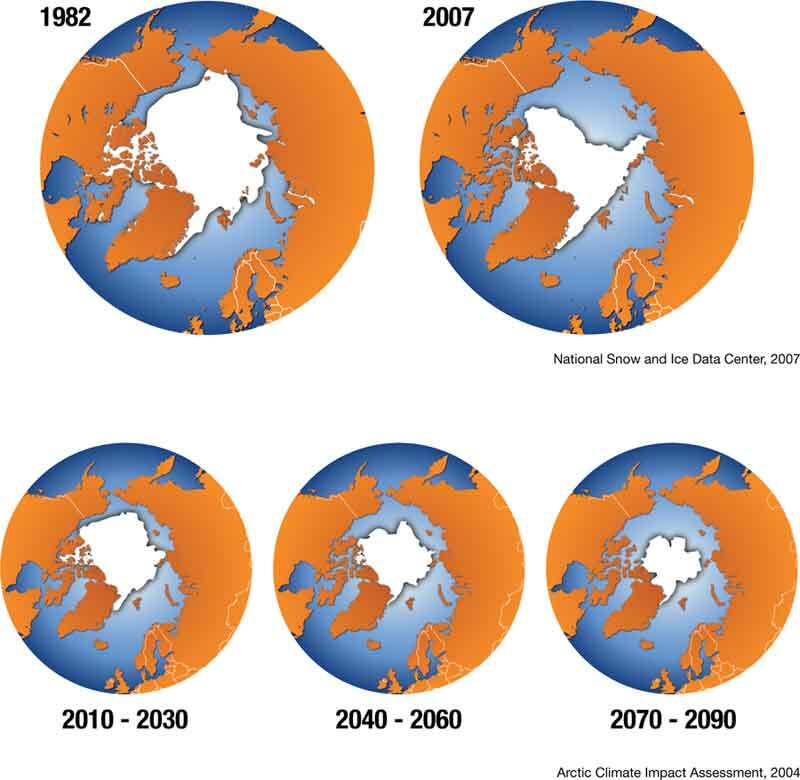 14% of the permanent ice in the Arctic Ocean melted in 2005; 23% more in 2007 (the worst melting ever); and nearly as much in 2008, opening the North-West Passage. Permanent ice in the Arctic Ocean may be gone by 2015-2030, although a recent shift in the North Atlantic Oscillation may provide a temporary reprieve. Greenland glaciers have doubled their rate of flow into the sea in the last few years (6km/year in 1997, 9km/year in 2000, 13km/year in 2003), now raising the sea level by 0.83 mm per year. Similar melting of the West Antarctic ice sheet is adding another 0.55 mm per year, and accelerating. These are warning signs that climate change is already happening. Glaciers are also shrinking on most of the world's mountains, threatening future water supplies. 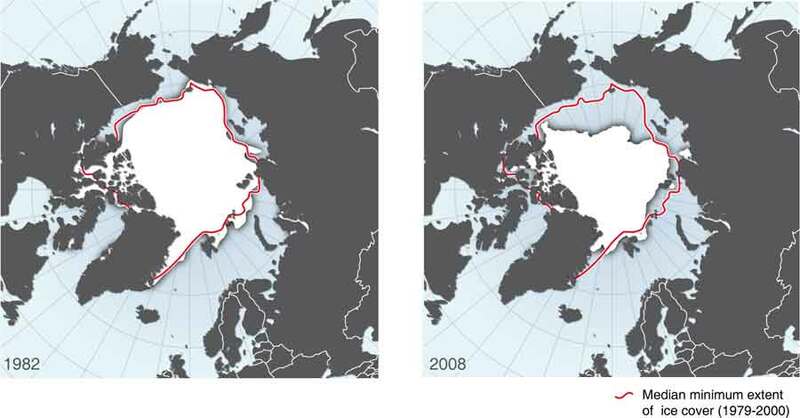 The maps below show the reduction in ice cover in the Arctic Ocean from 1982 to 2008. It this trend continues, the Arctic Ocean could soon be almost ice free in summer, as the projections below suggest. The combination of rising ocean temperatures causing seawater to expand, and melting glaciers adding water to the seas, is raising the sea level around the world, and this is accelerating. Recent estimates put the expected sea level rise by 2100 at between 80 cm and 2 meters, more than twice the highest previous projections. This will flood low-lying countries, islands, coasts and cities inhabited by hundreds of millions of people. There are 130 million people living within 1 m of mean sea level. In Europe, 13 million people would be displaced and $600b in property lost to rising seas. 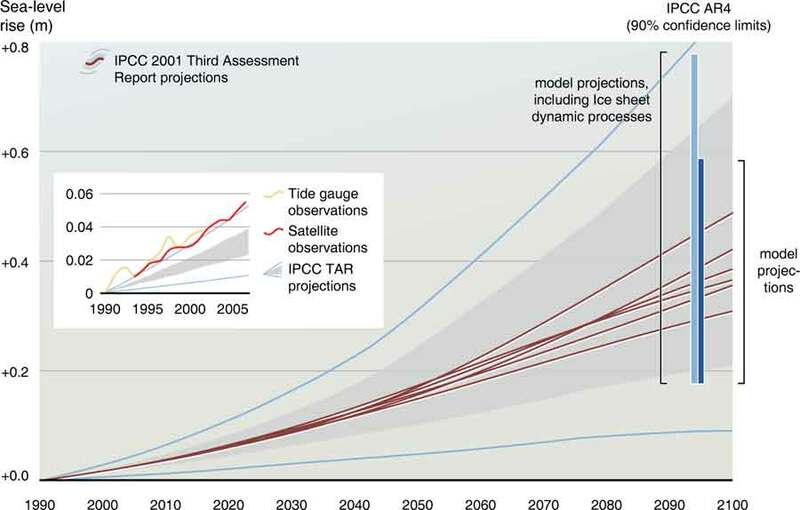 The inset in the graph below shows that the observed rise in sea level was higher than the highest projection in 2001. There is little time left to act. Global temperatures have already risen 0.6°C and will probably rise a further 3°, or even up to 4.5-5° by 2100, yet scientists say we must stay below 2°C. Ocean temperatures have risen at least 3 km deep. Glaciers and snow cover have decreased; cold days, nights and frost have become rarer; hot days, nights and heatwaves are more frequent. Sea level rise is accelerating. There has been a recent surge in CO2 levels from less uptake by plants. We may soon be approaching a tipping point where runaway climate change would be catastrophic. Some parts of the world are more vulnerable and could suffer serious collapse in this century. These include the Arctic Ocean and Greenland ice sheet; the Amazon rain forest which may dry out, burn and become a savanna; northern boreal forests where tree diseases are already spreading; an increase in the El Nino reversal of winds and currents in the Pacific Ocean affecting weather in North America, South-East Asia and Africa; the collapse of the West African monsoon; and an erratic Indian summer monsoon producing floods in some years and drought in others. Climate change will bring many environmental problems affecting agriculture, forestry, fisheries and tourism. Melting ice and changes in rainfall will produce water shortages. There will be more forest fires and soil erosion. The natural environment will also suffer, with the loss of 20-50 % of land biodiversity. In addition to forced migrations from rising seas, climate change is also increasing extreme weather events causing natural disasters such as cyclonic storms (hurricanes or typhoons), floods and droughts. Tropical and subtropical areas are expected to get drier, and cool temperate areas closer to the poles will become wetter. Up to half the world population is expected to live in water stressed regions by 2050. Agriculture will be severely impacted by changing climates, reducing food supplies. 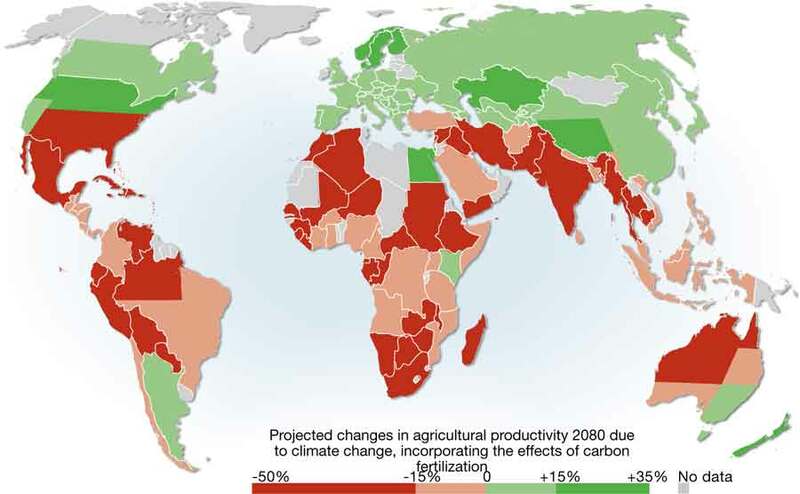 The map below shows expected climate impacts on agricultural productivity by 2080. It is obviously the poor that will suffer the most. Climate change is expected to force hundreds of millions of people to leave their homes and become refugees or migrants. Finding them new homes and livelihoods in places with adequate environmental resources will be an enormous humanitarian, social and economic challenge. 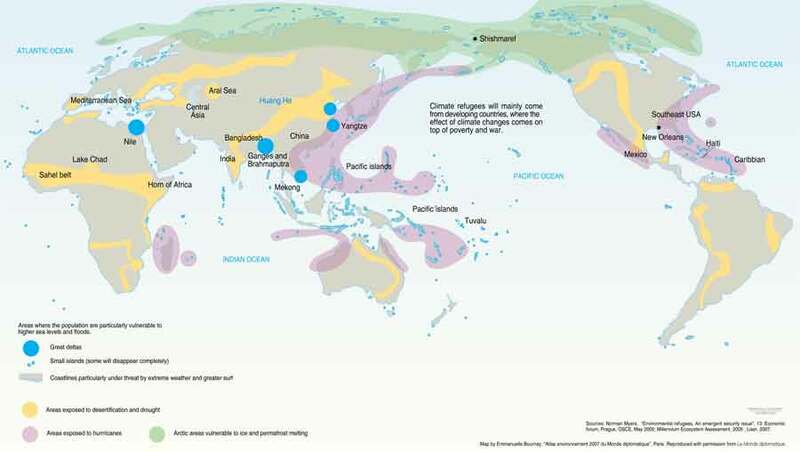 The human impacts of such rapid climate change are expected to be severe. The International Institute for Strategic Studies said in 2007 that If climate change goes unchecked, its effects will be catastrophic “on the level of nuclear war”. "The security dimension will come increasingly to the forefront as countries begin to see falls in available resources and economic vitality, increased stress on their armed forces, greater instability in regions of strategic import, increases in ethnic rivalries, and a widening gap between rich and poor." (International Institute for Strategic Studies, Strategic Survey 2007, September 2007). The UK Chief Scientist said on 19 March 2009 that the world faces a 'perfect storm' of problems by about 2030 as food, energy and water shortages interact with climate change to produce public unrest, cross-border conflicts and mass migrations. The economist Sir Nicholas Stern, in a report to the UK government, said that the annual cost of uncontrolled climate change could be more than $660 billion, or 5 to 20% of global GDP, as compared to 1% for control measures for greenhouse gases. He said climate change represents the greatest market failure in human history. We are all responsible for climate change. Everyone benefiting from the burning of fossil fuels is at fault. Everyone involved in land clearing or benefiting from land use changes is a contributor. How much we are responsible depends on our country of residence, lifestyle and consumption patterns, with the rich most responsible. The poor will be the greatest victims of climate change, while contributing the least to the problem. This is an ethical dilemma. There are different ways to look at responsibility for greenhouse gas emissions causing climate change, and this is a subject of intense diplomatic debate. The most common comparison is the share of global emissions per country to see who produces the most greenhouse gases, as shown here in the figure from the UNDP Human Development Report 2007. 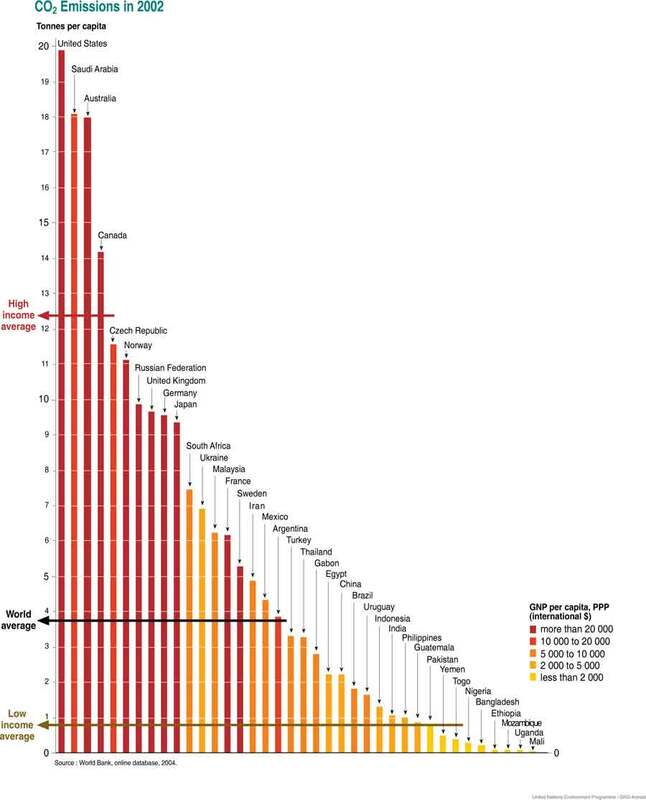 Some countries have been burning fossil fuels for much longer than others. Since carbon dioxide can stay in the atmosphere for a hundred years or more, today's problems are the cumulative result of many years of industrial activities. From this perspective, one should look at historical emissions (UNDP 2007). Equity would suggest that each human being should have an equal right to emit carbon dioxide, and therefore emissions per capita may be the best measure. As you can see, while some countries stand out, the different approaches give some very different results. Climate change cannot be separated from the challenges of economic globalization, energy and resource depletion, poverty reduction, social imbalances and security. Each problem interacts with the others in complex ways. Partial solutions will not solve the problems that threaten future sustainability. Governments are now trying to negotiate new measures to try to mitigate (reduce the causes) and adapt to expected climate change. This is not easy because we shall need to reduce greenhouse gas emissions by 80% or more by 2050. The only real solution to climate change is to leave the fossil fuels in the ground and find other renewable sources of energy to replace them. This will require a complete transformation in the technological basis of industrial society, greatly increased efficiency in energy use, and a major reduction in consumption among the wealthy while responding to the needs of the poor. No one is ready for such a transformation, but there is great urgency as scientists say we may have only about 10 years to change the whole direction of society before the damage becomes irreversable. Since we are all part of the problem, we must all contribute to the solution at our own level. Even those with little means can adopt development practices that move towards sustainability, like planting trees, taking care of the soil, reducing water pollution, and finding and using local renewable energy sources. Those whose basic needs are met must make significant changes in their lifestyle and consumption patterns, voluntarily sharing whatever is more than their needs. The motivation for such a transformation will have to be rooted at the ethical and spiritual level.